This DIY giftable goes out to my lovely sister who, after devouring a book on the history of candy, said I really needed to share one of the oldest candies in the world. One of the easiest to make too. Flavored sugars and, in this case, infused sugar cubes. Playing around with flavor combinations has been fun... raw sugar mixed with rum and coconut, lemon and lime, Turkish Delight inspired rose water with vanilla extract. Any infused water or flavoring extract will work plus a few drops of food coloring to match. All that's need is a day for your cubes to harden again which can be sped up by placing them in a low 200 degree oven. 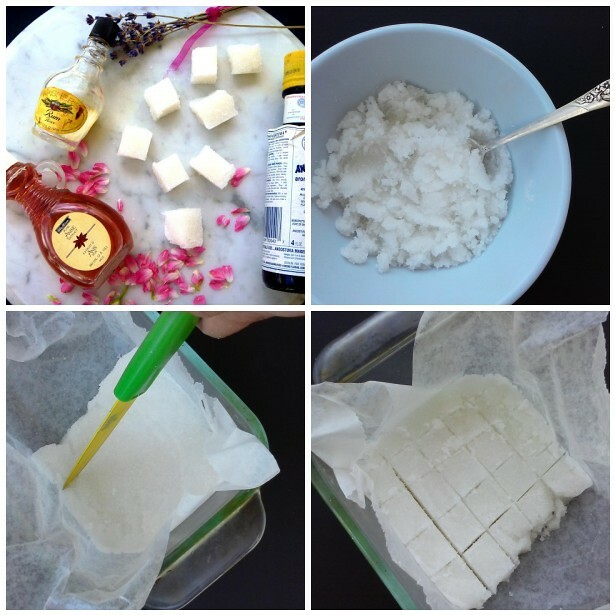 While these sugar cubes are infused with orange blossom water this basic recipe can use plain water, rosewater or water mixed with 2 or 3 drops of your choice of flavoring extracts. Food coloring can also be added to the water to tint your finished sugar cubes. Combine water and sugar until sugar is crumbly. Line a glass baking dish or old tea box with wax paper and press into the bottom using a glass. Once compacted, use a sharp, thin knife to cut cubes in the moist sugar.Allow to dry overnight or place in a warm oven for a few hours until hard. Gently break apart and you're done! If you rather infuse store bought sugar cubes combine 3 teaspoons of water in a small spray bottle and 5 to 10 drops of flavoring extract. Spread sugar cubes on a baking sheet and mist them. Place in the oven on low heat for a few hours to dry. Keep stored in an air tight container to help them retain their flavor.